Deep clean without scrubbing. Remove 100% limescale. 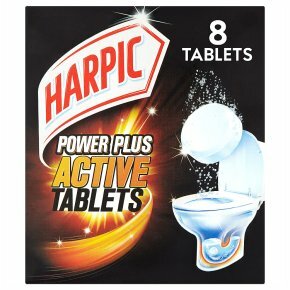 Works in the u-bend.Harpic Power Plus Tablets start working immediately to thoroughlyclean under the waterline, without any need to scrub. Dosage Instructions For regular cleaning, use 1 tablet per week For best results, leave for 6 hours before flushing For removal of heavy limescale build up, use 2 tablets and leave overnight Suitable for septic tanks Usage Instructions & Directions 1. Wear suitable gloves when removing the protective wrapper. 2. Lift up the toilets seat and carefully drop the tablet(s) into you toilet bowl. 3. Leave for at least 20 minutes with the toilet seat in the upright position. 4. Flush toilet.